What would a model of care among species, of communication between kinds, of collaboration across earthly beings, be like when it comes from an “extreme” location? Can the margin, the peripheral, even the antipodes, be rethought as an extremity-oriented centre? Perhaps this is not so hard to image: as I have increasingly found in Tierra del Fuego, the more one ‘excavates’ the particular history of this archipelago off the south of South America, the more interwoven it becomes with other places—the more it grows laterally. Can the end of the world, the finis terra, provide something more than an inverted image of its (colonial) other and become a model of affinity (ad finis) among kinds? Can speculation coming from/at the end of the world move away from the emphasis placed on vision at the root of our species, and our speculative logocentrism, to a form of seeing-understanding that is thinking-feeling—that thinks-senses? Might interspecies communication be finding ways to arrive at a common sense (sensus from the Latin, sentire: to feel, to know, to find one’s way)—a common ground beyond the human? Could this process be understood as a decolonization of the senses? What if to know, as poet and artist Cecilia Vicuña has suggested, is to be with (“conocer, con o ser, ser con“)? Can one identify with one’s opponent, care for the “enemy”, even perhaps become it? I would like to think of Ensayos, a “nomadic residency program” founded in 2010 that mostly takes place at Tierra del Fuego, less as a model or an inverted mirror than as a performative platform that resituates thinking about ‘the end of the world’ (whether that is the human(ist) world, life on earth as we humans know it, or a geographical end of the world at the south) as a sensorial/aesthetic engagement (thinking-feeling) with multispecies collaborators (co-labourers in Donna Haraway’s terms) seeking to imagine and put in action (“imaginación, imagen en acción“, according to Vicuña) different ways of being with and in the world. Ensayos is/is not a thing (a residency, an idea, a curatorial vision), and works as a temporal, shifting assemblage of practices that try out ways to create common grounds and listen to other beings (inanimate and inanimate) speak. I tend to think of Ensayos in theatrical terms, as constant acts of staging, performing, representing, practicing, and learning—acts that also define scientific practices—from Tierra del Fuego herself, from her history, her strata, her present, her movements; from the localized and/or migrant practices of her colonizers and visitors; from a variety of fields that meet in her varied spaces (including biological sciences, social sciences, sheep businesses, tourism, and art among others); and from body to body. It sets up spaces for dialogues like a shelter (precarious, temporary, resistant)—yet these do not occur necessarily through words: this is where decolonizing the senses creeps in. Dialogue in Tierra del Fuego has historically been a matter of signs and their performance: from the smoke interpreted as fire that gave it its European name to the gestures of Fuegians towards incoming boats that were read as desperate begging; to the interpretation of body paint, costume, sound and song as the reenactment of a spirit world; to the movements of water, sky, and earth as confiding gestures speaking in the tongues of wind, wafts of odor, touch. Ensayos might thus be thought-felt as a practice of connecting corpo-realities, of learning to speak with/in another tongue and of communicating differently. 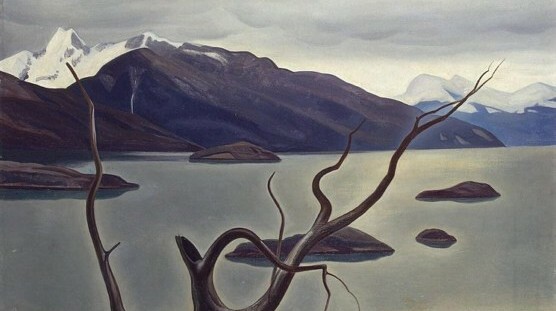 Image credit: “Admiralty Sound: Tierra del Fuego”, Rockwell Kent, Oil on Canvas, 1922-1925.